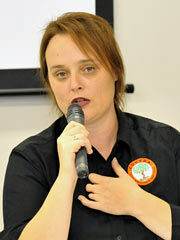 Agent Orange second-generation victim Heather Bowser gave a lecture at the Okinawa Prefectural Assembly on November 11. Her late father was a Vietnam War veteran and a victim of the defoliant known as Agent Orange. She was born without a right leg below the knee, the big toe on her left foot and several fingers. Dioxins have been detected recently in barrels unearthed in a soccer field in Okinawa City. Bowser urged the authorities to carry out health surveys for residents living near bases and for Okinawan workers at the U.S. bases, including those already retired. During the panel discussion that followed the lecture, Jon Mitchell, a freelance journalist who has interviewed U.S. military veterans who are Agent Orange victims, commented that herbicides were used at least fifteen bases in Okinawa. At the Okinawa Prefectural Assembly in Naha on November 11, Heather Bowser stressed the risk posed by defoliants. Bowser stressed that people who ignore the problem will in effect become accomplices of the U.S. government, adding that nothing will change unless residents take action. She said that Vietnam veterans suffered from serious health issues such as ischemic heart disease, cancer, and Parkinson’s disease. She suggested that if such diseases had occurred among a particular age group and in certain regions in Okinawa, it would provide a clue towards proving the storage or use of Agent Orange. The U.S. government has insisted that it did not use Agent Orange in Okinawa, but Bowser warned that residents would be exposed to defoliants forever if they merely waited for the government to change its stance. She recommended that in cooperation with medical institutions, Okinawa set up a desk to provide a consultation service for possible victims of defoliants. Mitchell criticized the U.S. Department of Defense for hiding the facts about Agent Orange. He said that the U.S. government should tell the truth, and that the contamination of bases is a criminal act against the people of Okinawa.